Lock in a great price for Hotel Museo Spa Casa Santo Domingo – rated 9.1 by recent guests! Amazing place. Very unique. It is a tourist attraction in itself. The staff was great, food, service, cleaning and the whole experience there was excellent. Let’s be clear, this hotel is a little more expensive than other hotels in Antigua but the price is well set since IMHO this is the only hotel up to international standards in the historic center. The hotel is a museum as well. The ruins are spectacular. The fact that you are actually staying in a very, very old building is amazing. It is very comfortable, the rooms are warm, even though it is cold outside. The food in the restaurant was spectacular. The food presentation was beautiful and the waiter was very polite and friendly. Wonderful grounds, great on site museums and food. excellent location, close to main part of town. Extremely freindly staff, great rooms. This place is gorgeous! We thought of staying one night just to try it out, but we needed at least another night. It is on the more expensive end, but it is worth it, if you can afford it. Their restaurant's food is very good too. Again, if you can afford it, it is worth it. 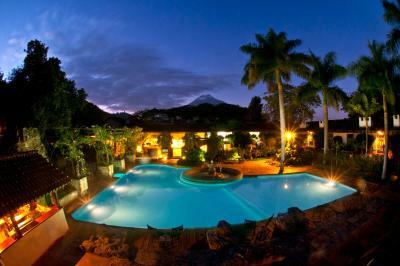 The hotel has the most spectacular view of the volcanoes and the amenities are amazing. Beautiful Hotel, centrally located to restaurants and shops. Everyone was super nice and friendly. Above and beyond staff !! SPA is amazing !! The grounds of the hotel are beautiful, and the size of our suite and the view from our terrace - facing the volcanos - was amazing! The breakfast buffet is lovely, and the lunch we had there was excellent too. Hotel Museo Spa Casa Santo Domingo This rating is a reflection of how the property compares to the industry standard when it comes to price, facilities and services available. It's based on a self-evaluation by the property. Use this rating to help choose your stay! One of our top picks in Antigua Guatemala.This luxurious 5-star hotel is set a 10 minute walk from the center of Antigua Guatemala. 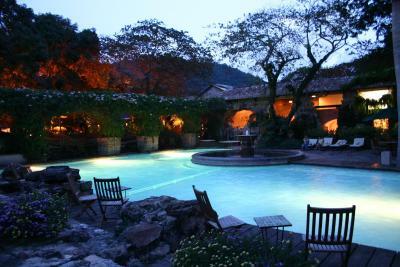 In a former convent, it offers an outdoor pool, spa and gym, as well as several museums and galleries. Set within pretty gardens, the spacious rooms at Hotel Museo Casa Santo Domingo feature elegant décor, a fireplace and scenic views. Plasma cable TV, a safe, minibar and private bathroom all feature. The gourmet El Tenedor restaurant serves breakfast and traditional cuisine and guests can enjoy snacks and refreshments on the terrace from the El Cabido bar. Casa Santo Domingo offers guided tours of its attractions, which include a pharmacy, colonial art and archeological museum. There is a pottery and wax workshop, a chapel, and Antigua´s largest jade factory and museum. Car rental is available and Hotel Museo Casa Santo Domingo offers free private parking and daily airport shuttles for a fee. It is 28 miles from Guatemala City. When would you like to stay at Hotel Museo Spa Casa Santo Domingo? This elegant room features stylish decor, 1 king-size or 2 double beds and pretty garden and pool views. It has a fireplace and comes with plasma cable TV, a safe, mini-bar and private bathroom. Wi-Fi is available for an extra cost. This more spacious room has a lounge area with sofa bed. It features stylish decor, 2 double beds and pretty garden views. It has a fireplace and comes equipped with plasma cable TV, a safe, minibar and private bathroom. Wi-Fi is available for an extra cost. 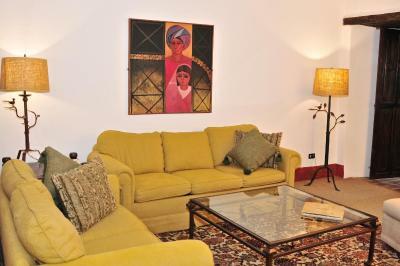 This spacious and elegant suite has a separate lounge area with sofa bed and dining table. It features stylish decor, 2 double beds and pretty garden views. It has a fireplace and comes with plasma cable TV, a safe, mini-bar and private bathroom. Wi-Fi is available for an extra cost. Please note that the price is based on 2 adults, plus 2 children, or in 2 adults plus a additional guest. This additional guest will have to pay USD 44.80 per night. This double level room (with stairs) features one king-size bed, a mini-bar and a living room with a seating area with fireplace. It has flat-screen TV with cable channels. The room offers a view to our archaeological area. The bathroom has bath or shower and free toiletries. This room features one king size bed and a terrace with spa bathtub and garden views. 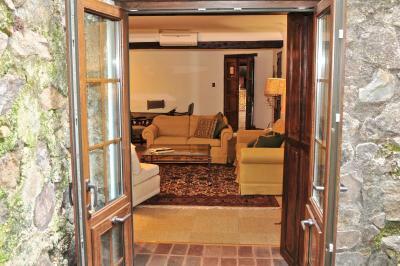 It has flat-screen TV with cable channels, a minibar and a sitting area with fireplace. The bathroom has shower and free toiletries. 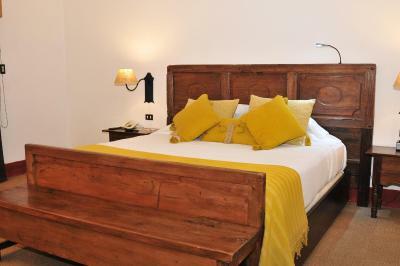 This room features one king-size bed or two full size beds and a terrace with spa bath and garden views. It has flat-screen TV with cable channels, a mini-bar and a DVD player. The living room with fireplace and dining room are separated. The bathroom offers bath or shower and free toiletries. This room features a terrace with garden views, a spa bathtub and sauna. It has flat-screen TV with cable channels, a minibar and a DVD player. The living room with fireplace and dining room are separated. The bathroom offers bathtub or shower and free toiletries. 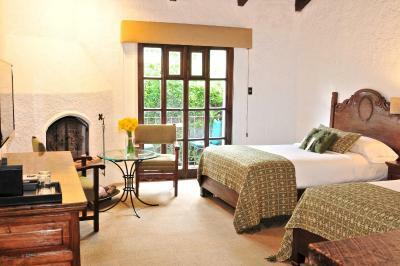 This room features stylish decor, 1 king-size or 2 double beds and pretty garden views and a direct acces to our Spa. It has a fireplace and comes with plasma cable TV, a safe, mini-bar and private bathroom. Wi-Fi is available for an extra cost. Note: This room is exclusively for adults. This room features one king-size bed, terrace with spa bath, garden views and access to the SPA. It has flat-screen TV with cable channels, a mini-bar and a DVD player. The living room with fireplace and dining room are separated. The bathroom offers bath or shower and free toiletries. This room features a terrace, a spa bath and direct access to the SPA. It has flat-screen TV with cable channels, a mini-bar. The living room with fireplace and dining room are separated. The bathroom offers bath or shower and free toiletries. 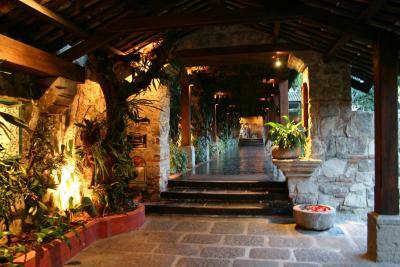 House Rules Hotel Museo Spa Casa Santo Domingo takes special requests – add in the next step! Hotel Museo Spa Casa Santo Domingo accepts these cards and reserves the right to temporarily hold an amount prior to arrival. The Sofa bed has an extra fee. Breakfast isn’t great. Rest of the food is fabulous. But for some reason there isn’t even fresh fruit juice. Amazing hotel full of character and texture and ambience! Haven’t stayed in a more gorgeous place. Would love to go back. The staff, the rooms, the facilities - it’s like living in a well restored 17th century monastery - imagine that! Every detail is thought through. Everything more than exceeded my expectations. An unforgettable experience! Amazing and unique hotel— totally fabulous in every way. If you are a fan of monasteries and ruins and want to live in one, this place is for you!! Totally worth the money!!! Nice hotel. Great location. Delicious food. It’s overpriced; you had to pay extra for too many things including for potable water. Some snotty attitude from staff. Its historic value & well maintained. Amazing hotel well worth the price. Location is a bit further from the main shops and restaurants but still within walking distance. Our room was so full of smoke at night that we had trouble breathing and eyes were stinging. Our dinner tasted fantastic but we both had diarrhea within two hours of eating. The staff was extremely friendly and helpful. The dishes served in the restaurant were excellent. I loved all the candle lights by night. The interior decoration was of sturdy high quality, no plastic in sight, in very good taste, Lots if open spaces with trees, flowers and birds. Thank you. A bit noisy in my room as it was near the street. I love animals, And I don’t think it is fair they keep parrots there. Its not like they are not well taken care of, but birds deserve to be free.